All About Art: Oil paintings – more oil paint or less? Oil paintings – more oil paint or less? Portraits - it is obvious that the face on the portrait has to be flat, there are many reasons why, but unless it is an abstract painting any 'ups' or 'downs' will create additional shadows base on where the light source is located and can ruin the artwork. As long as the face is flat everything else is just based on style -Either enough oil paint can be used to just barely cover the canvas, when the canvas texture is still visible up-close, or more can be used to make sure that the texture is hidden. The first approach is safer since the paint most likely will not crack, the second one requires more experience but the basic rule is - to prevent cracks the later layers of paint should be thicker than the previous ones. Besides faces the rest of the painting can be done virtually in unlimited number of ways. The most common approach is to keep the thickness of paint consistent throughout the oil art, and it used a lot in the classic impressionism paintings by many famous artists. It doesn't have to be this way. Paint can be used to put emphases on some objects in the composition and to create a 3D feel to artwork. 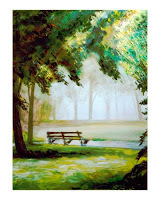 Here is an example of landscape oil paintings where the center of the painting is flat, but the trees and leafs were created using much more oil paint making them appear closer. In some parts of the painting the paint is up to half an inch above the canvas surface. Shadows in this case is not an issue, since in this landscape painting different position of the light source will create an impression of seeing this park at the different time of the day. The one thing that will work against this painting is a direct light source aimed in the middle of it, it will hide all the intended effects and will make painting look good instead of exceptional. This never happens in life, homes or galleries never have a light source directed to the middle of the painting, and if it is not aimed from the side then it will be from above. Portraits can be 'enhanced' the same way. The face has to be flat, but no one said that the rest of the painting has to be flat as well. The rest of the painting is left to artist’s imagination and a lot can be done there. Again, combination of colors, texture, light source and many other things is what makes the painting 'work' and if it was as simple as following the rules then everyone would be a great artist. See more Oil Paintings that are done using some of the techniques described above.